Sights and sou nds from Arlington National Cemetery are common during the summer month as we celebrate Memorial Day, Flag Day, and Independence Day. 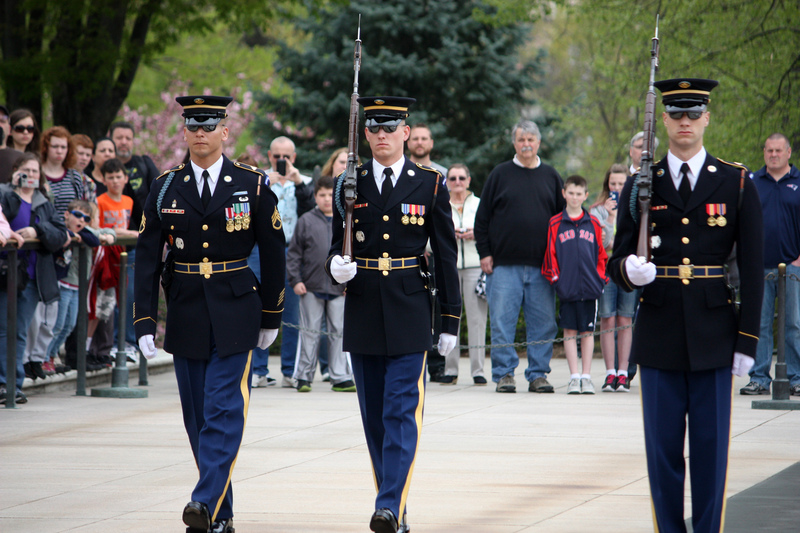 This year has provided the extra celebration of Arlington’s 150th anniversary! Visiting Arlington is memorable for students as they witness the sobering reality of duty and sacrifice. Sohailah, a seasoned Education Program Leader, reviews a book she has used to prepare herself to introduce students to Arlington National Cemetery. When I read In Honored Glory for the first time, it made a huge impact on me. I read it at the beginning of every tour season for at least the first five years. I’ll admit, these days I mostly use it as a reference guide – I love the appendices. This book doesn’t just give the facts of the cemetery and the top highlights. It gives detailed history about many aspects of the cemetery, and mentions and describes other national cemeteries, as well. I am often asked about the different religious symbols on the tops of the headstones, and I really like having a book to refer to, if the symbol happens to be an unusual and rarely encountered one. Before becoming a tour guide, I had the opportunity to do some travel abroad. I remember being touched by the Changing of the Guard at Buckingham Palace. I also saw the Changing of the Guard in Athens, Greece, in November 1997. There was no explanation of what they were protecting, and the “routine” seemed almost jokey to an outsider. I can say with no reservations, that regardless of whether a person has read In Honored Glory or not, watching the Changing of the Guard at the Tomb of the Unknowns at Arlington is one of the most moving experiences a person can have. I would say that my favorite chapter in this book is Chapter Five, “Under My Eternal Vigilance,” because I love the history of how the Tomb of the Unknown began – as a counterpart to the Tomb of the Unknown in France at the Arc De’ Triumphe and in England in Westminster Abbey. However, every chapter is interesting – I learned about Ignace Paderewski and other foreign nationals buried at Arlington. I also learned (and was initially surprised) about the Confederate Memorial here at Arlington. I like the fact that there are soldiers from every war ever fought by Americans interred at Arlington National Cemetery, including the 11 Revolutionary Soldiers, the Confederate soldiers with their slightly pointed headstones so “no d*** Yankees can sit on their headstone and disrespect them” and the Colored Troops section, that you walk through if you enter or exit the cemetery by the Marine Corps’ Memorial (Iwo Jima). When I first read this book, it was in 1998, and there were several events that had not yet happened – from September 11, 2001 and our subsequent entry into War against Afghanistan and Iraq, to the crashing of the Space Shuttle Columbia upon re-entry over Texas in February 2003. I am grateful that this book is one that is updated, so as to give more accurate numbers on buried and information as to where specific people and memorials are located in the cemetery. I will say I tend to read the Appendices more often that the entire book, as it has so much useful information and interesting facts. All in all, I can say I recommend this book with the highest confidence that the reader will have an interesting and informative read.